Melanotan II is a highly potent synthetic peptide analogue of α-MSH that may elicit melanogenic, aphrodisiac and anorectic effects through non-selective stimulation of melanocortin receptors. 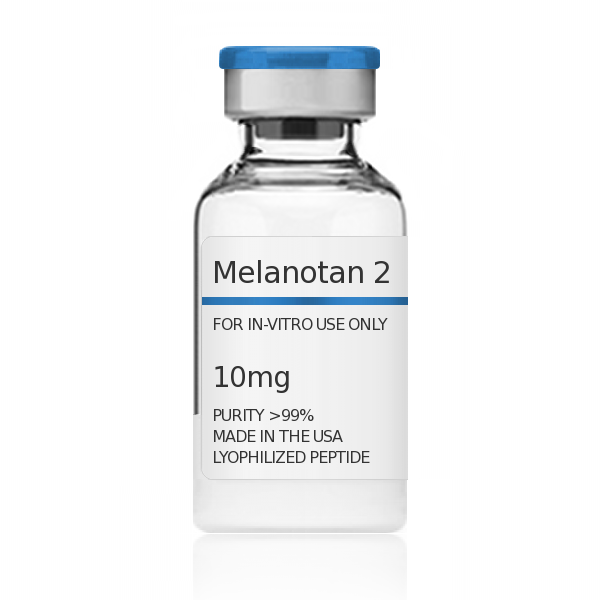 Melanotan-II consists of seven amino acids and is a cyclic, shortened lactam variant of alpha-Melanocyte-stimulating hormone (α-MSH), a multifunctional peptide that regulates a broad array of physiological functions. Melanotan II has been studied extensively for use in protecting against the harmful effects of ultraviolet radiation from sunlight due to its melanogenic properties. GHPeptides™ Melanotan 2 has a peptide purity level that exceeds 99.0% as determined by HPLC. This peptide was synthesized with no additives and is supplied as a white lyophilized (freeze-dried) powder. It is recommended to reconstitute the lyophilized Melanotan 2 in sterile water, which can then be further diluted in other aqueous solutions. Lyophilized Melanotan 2 although stable at room temperature for 3-4 weeks, should be stored desiccated below -18°C. Upon reconstitution, Melanotan 2 should be stored at 4°C out of direct light for between 10-14 days and for future use below -18°C. Prevent repeated freeze-thaw cycles.